Greenhill B&B01763 837170work Bed & BreakfastGreenhill offers tranquil, private accommodation in the detached annexe of our period home. Both twin and double rooms are spacious and have their own bathroom, flat-screen TVs with freeview and views of the garden. Breakfast is freshly cooked using local produce and is served in a room full of character with beams, studwork and open fireplace. Wifi is available in the main house at breakfast. There are several excellent village pubs that serve good food within a short stroll and many more within a 5 minute drive. A car is advisable and there is off-road parking. Greenhill is in a great location to visit many places and attractions. 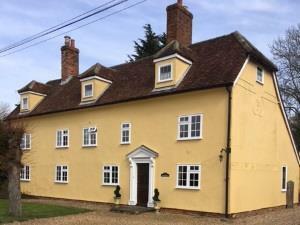 Saffron Walden , Saffron Hall and Audley End are all a 15 minute drive. The Imperial War Museum at Duxford is very close. Cambridge is easily accessible with Trumpington Park and Ride about 10 minutes drive. Wimpole Hall and Anglesey Abbey are not far away. Royston has a good train link to London. We look forward to welcoming you and trust you will enjoy this beautiful part of the country. Greenhill offers tranquil, private accommodation in the detached annexe of our period home. Both twin and double rooms are spacious and have their own bathroom, flat-screen TVs with freeview and views of the garden. Breakfast is freshly cooked using local produce and is served in a room full of character with beams, studwork and open fireplace. Wifi is available in the main house at breakfast. The easiest route to Greenhill Heydon is from the A505. Take the turn signposted Chishill and Heydon. Once in Heydon turn right at jct opposite the church. Go past King William IV pub on the left and Greenhill is a yellow house 400 yards further on the left. By Public Transport: Royston railway station - no public transport to Heydon, but taxis are available.